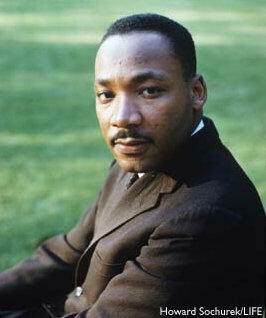 I also look at Dr. King as a prophet. If you can’t see that, I recommend listening to his call to America for a Radical Revolution of Values. In my opinion a prophet is someone who sees reality as it is and not as they are told to. If you listen to his words and then look at the world around us, you would have to be blind, ignorant, in denial, or a liar not to see that his message is still relevant today. Another description that suits Dr. King is healer. I learned from an African proverb recently that a meaning for healer is “an awakener of those who have slept too long.” If that isn’t Dr. King, I don’t know what is. We still revere Dr. King the way we do, because many of us are still asleep. We’d rather hear an easy lie than the hard truth. But Martin had been to the mountain and he knew that this world of separation that we cling to is a lie. I believe that he knew that God’s reality is one of Unity and that all things that work to divide are false. I am aware that like most people Martin Luther King Jr. had his weaknesses. But I cannot say that they were any more than other prophetic figures in the Bible or elsewhere. I think the point is that he made the choice to live by an ideal that transcended the “what’s in it for me” mentality that is rampant in this society. In fact, I don’t think that he would have cared too much about the memorial that is up in his honor. I am not saying anything against it. I just think that he would have felt that the best memorial that we could erect for him would be in our hearts where we too can commit to an ideal. Martin King Jr. was an adherent of Gandhi’s satyagraha teachings. Gandhi taught that we must be the change that we want to see in the world. That’s what Dr. King was striving for. I feel that Martin chose to look at the world with a view from the mountain and lived as if everyone should be able to see it. He walked among us with the belief that the “Promised Land” is a present reality. In so doing he lived into the Lord’s Prayer that God’s will be done on Earth as it is in Heaven. Personally, I don’t think that you have to be a religious person to see the value in treating others as you would like to be treated. And essentially that was Dr. King’s simple message to the world. That’s all it takes to wake up and live into God’s reality–where every land can be and in actuality is the Promised Land.